Our Rainbow Cafe at NOAC 2018 was a huge success! Thanks so much to our generous donors who made it possible. Please read on to see our daily reflections and gain a better sense of our purpose at BSA events like these. 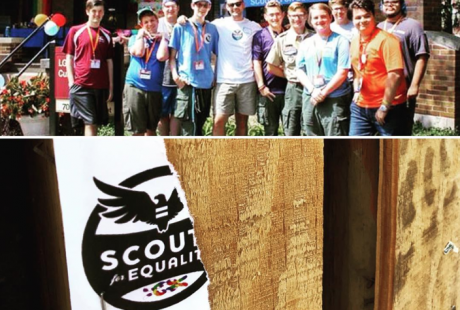 As you may know, Scouts for Equality has been working in collaboration with our friends from the Indiana University First Nations Educational & Cultural Center and the Indiana University LGBTQ+ Culture Center to create a space dedicated to inclusion and belonging at the BSA’s 2018 National Order of the Arrow Conference. We’ve spent the past day meeting with our friends at these offices, learning about their history and current projects, and building our beautiful Rainbow Cafe on the front porch of the LGBTQ+ Culture Center. Rainbow flags, rainbow streamers, SFE signs, limited edition SFE lodge flaps, snacks, and coffee… we’ve got it all! We’re so excited for NOAC to officially kick off tomorrow and very much look forward to seeing many of you at our cafe. Please take a few moments to stop by and see us! 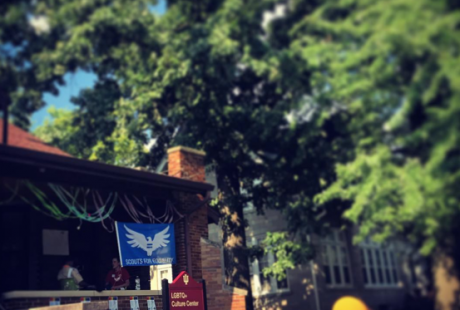 We’re located at 705 E 7th St, which is right next to the main activities of NOAC – less than a five minute walk from the Indiana Memorial Union. Throughout the week we’ll offer a number of opportunities for engagement and reflection, including Facebook live videos, updates on Twitter and Instagram, and these daily reflection emails. You can help us spread the word by watching, commenting, and sharing – even if you’re not here in person. For those of you that are here in person, we ask that you do us a huge favor and share the news with at least one friend. Even if they haven’t been a supporter of Scouts for Equality in the past, we’d love to meet them and invite them to have some open conversations with our friends at the LGBTQ+ Culture Center and First Nations Educational & Cultural Center. Today for NOAC 2018 we had an overwhelming turnout of Scouts and Scouters at our Scout Pride Rainbow Cafe. One very profound experience for me personally was a Scout who, coming out, had an unpleasant experience with his well intentioned but ill informed Scoutmaster. This especially left an imprint in my mind due to the fact that he was comfortable in sharing his story with all of us, even though he had only met us moments beforehand. What this affirms for me is that over our years of struggling for progress and providing support, we have shown marginalized people that SFE is a safe place to share their story, be believed, and made to know that they belong. We are looking forward to the rest of our week here and cannot wait to meet as many more of you as we possibly can. You can find us on the front porch of the Indiana University LGBTQ+ Culture Center at 705 E 7th Street, Bloomington IN from noon to 5 pm each day. Words fail me today. Words fail because my heart is saturated with joy and possibility as well as grief. At 3:00 pm, a small group of LGBTQ+ and Ally scouts organized themselves to gather at our little Rainbow Cafe. Together, they enjoyed that kind of laughter experienced only in the company of others who know your pain, who know your power, and who want to laugh with you exactly as you are. Together, they envisioned the future of scouting in America with all of its flaws, brilliance, challenges, hubris, and potential. Together, they talked about how they were not going anywhere. They talked about how good it felt– many for the first time– to know that they were not alone in scouting. I listened to their dreams and testimonies with pride– beaming– honored to bear witness to their resilience and savvy. I remembered my own voyage through the murky waters of identity as a scout. Tears streamed down my face as I realized that I could never have imagined such a gathering. But there is was, right in front of me. The Oath and Law embodied. The future of scouting in America. Powerful voices seeking a more humane future for all of us. We have come so far. And yet, today we also learned our flyers, sanctioned by the University of Indiana’s LGBTQ+ Culture Center and First Nations Educational & Cultural Center, are being torn down across campus. We heard many recount how they’ve heard people insist there is no place for things like pride in scouting. The list of hostilities goes on; and this list makes me grieve the chasm between scouting’s own values and the actions of so many scouts and scouters. Which is exactly why we are here. I grieve, but I am also overjoyed. There is so much for all of us to learn. Fortunately, there are so many wise teachers. I believe Scouting should be a method for waging love and equity in an unjust world. It’s time to heed the voices of those who have been and continue to be marginalized in our movement. Without them, we will not learn from the mistakes of the past, nor will we mature into the skillful, justice-seeking people our world so desperately needs. Tonight I’m thinking about ripples. I’m thinking about the kids who come to our Rainbow Cafe this week and find, for the first time in months, people that will sit with them and just listen, a space where they won’t be judged for trying to figure out who they are. I’m thinking about the seed that spending an hour on our porch will plant in their heads, the hope that they’ll take back home somewhere that might not be taking care of them the way they need. I’m thinking about these ripples because I’m starting to realize what our space does for kids who haven’t ever found anything like it. I’m thinking about the Scout who approached me today just to tell me this was the first place at the whole conference he felt like he could be himself. I’m thinking about the transgender Scout who described to me how their parents didn’t support them after they came out last year, and the bisexual Scout who told me a sizable chunk of his friends abandoned him when he came out, and watching both of them bond creating rainbow paracord bracelets on our porch. I’m fantasizing about the ripples that spending time here placed in their heads. And I’m thinking about ripples because ripples turn into waves, for better or for worse. I’m thinking about the father who stopped by this morning to let us know, through tears, that his transgender Eagle Scout daughter was rejoining Scouting as an adult volunteer. But I’m also thinking about the mother who told me about her gay son who quit Scouting in 2005 after years of participation, simply exhausted by hiding a huge chunk of his identity. And I’m thinking about a Scouter who recounted being a part of a community grappling with increasing rates of LGBTQ youth suicide. What I’m realizing more and more this week is that, for the Scouts we serve, the tiniest encounters can have huge impacts. Every Scout needs a space where they can be heard and feel safe, because the difference between a single affirming experience and a damaging one can be absolutely enormous in the long run.  One question we’ve repeatedly been asked this week is– why aren’t you officially at NOAC? Why isn’t this building on the conference map? Honestly, I want to know too. I want to know what’s more important than giving these kids a place to feel comfortable and safe and planting seeds that will help them cope with an activity that they struggle with. Our Friends of SFE map is bursting with hand-drawn stars from Florida to Mississippi to Wisconsin to Washington and everywhere in between, and that gives me hope for more ripples, scoutmasters and advisors and Scouts themselves leaving Bloomington on Saturday to go transform their home troops and crews and lodges into the welcoming, affirming spaces they should be for everyone. 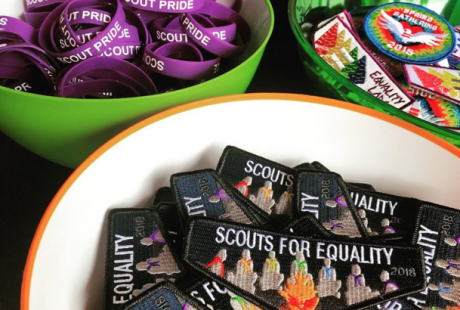 Throughout our 5-day #ScoutPride Rainbow Cafe at NOAC 2018, we distributed 500 patches, 300 “SCOUT PRIDE” bracelets, hundreds of Inclusive Scouting Award knots, and an abundance of snacks. Conservatively, 500+ NOAC attendees visited our inclusive and affirming space made possible by the IU LGBTQ+ Culture Center’s generosity. Through our partnership with the IU First Nations Educational & Cultural Center, many were able to have their perceptions of First Nations & Indigenous culture and appropriation complicated, challenged, and deepened. Together, we observed deep mutuality and important differences between continued justifications for the marginalization of LGBTQ+ communities and the silencing of Indigenous voices in scouting. Again and again, we asked: “Who feels like they don’t belong in scouting, and why?”. On our last day, we discovered that someone wrote “I hate gays” on a piece of paper set out for those interested in coloring or doodling. 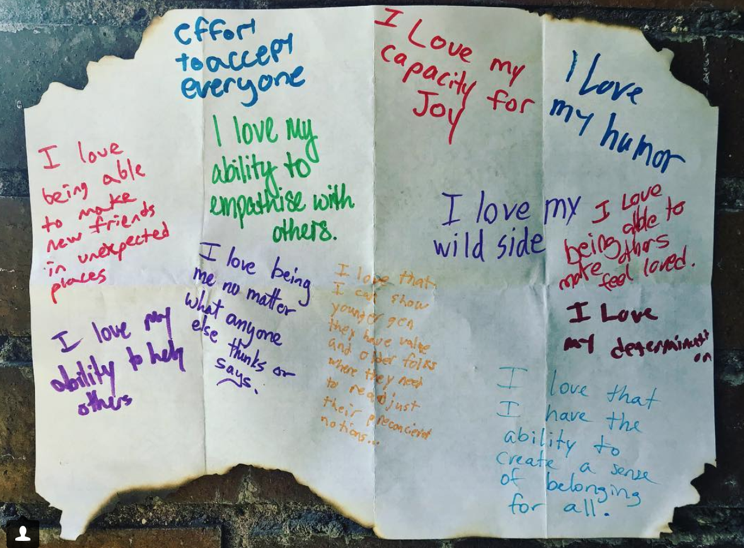 An LGBTQ+ scouter found the note and decided, in an almost ceremonial way, to remove it from our space by burning it off the page. Within the charred remains, we invited anyone identifying as LGBTQ+ to write one thing they loved about themselves. Together, we asserted our solidarity and self-love; even as the burnt edges of the page reminded us of our reason for doing so. When the time came to pack up the Rainbow Café, to our great surprise, 8 Scouts arrived to help us. They were grateful for our presence and were eager to serve. Without any promise of praise or reward, these young people (who may or may not identify as LGBTQ+) took down rainbow streamers, swept frayed fragments of rainbow paracord, hauled rainbow chairs, and prepared the IU LGBTQ+ Culture Center to welcome new students next week. Together, we laughed as we worked. They exemplified cheerful service on behalf of Scout Pride. They proved there is no separation between the values of inclusion & belonging and the Oath & Law. We leave NOAC knowing the road we must walk together is long. And the future: stunningly bright and brimming with possibility.